These dayhiking tips are geared toward beginner hikers who are just starting out. But even seasoned trail veterans might learn a new trick from this old trail dog. Let's get started with what a hiker needs for a successful day hike, and then build upon those important basic day hiking tips. What do you need for a day hike? footwear that continues to feel good all day. What should you eat before a long hike? Explore dayhiking food tips here. Don't forget the hiking snacks for energy! Pay attention to these basics, and you're all set for dayhiking on well established trails. If you're wondering what to wear when you go hiking, you're in the right place for some day hiking clothing tips. For your first few hikes, you can put together the clothing you already own into a hiking outfit. Caveat: But only if you scout weather forecasts for safe hiking conditions, and can cherry pick warm, dry weather. Once the hiking bug bites (not to be confused with regular bug bites), you'll want to invest in weather-appropriate and durable hiking clothes. Speaking of regular bug bites, if you're squeamish about insect bites, consider carrying a bug net. 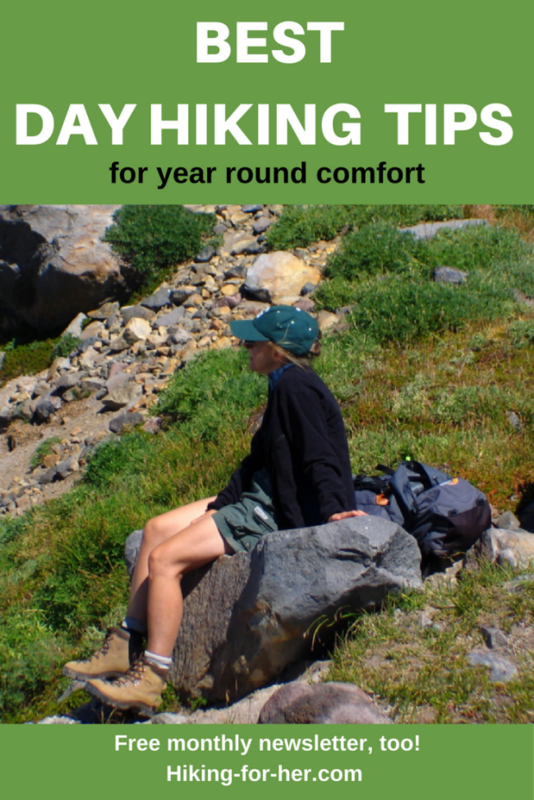 To share some seasonal dayhiking tips for hiking clothing, I'll take you through what I wear on the trail in a typical hiking year. I'm not a rock star hiker or a trail fashionista, but I've been through my share of downpours, wind storms, hail, mud holes and bug blizzards. I had to figure out the hard way how to do that whole "safety and comfort" thing. So let's short cut the process for you, based on my mistakes. Cool mornings followed by warm afternoons present a challenge for hiking clothes. What's a hiker to do to stay warm, but not too warm? Pay careful attention to the layers of clothing you wear. To give you an idea of what to wear hiking in the spring and fall, here's the Hiking For Her "official" top to bottom spring & fall hiking wardrobe. Your core temperature is an important asset to guard on cool weather hikes. light soft shell or fleece jacket. I remove the jacket once my boots are laced up and I've stretched at the trail head. Starting off too bundled up is a rookie mistake. Best to be a wee bit chilly for the first ten minutes, because you'll be steaming hot in no time at all, especially if your hike is going uphill. If you're concerned about getting cold hands and ears, start off with a pair of thin fleece gloves (or waterproof gloves if it's damp) and a headband. The vest comes off mid-way through the morning, or sometimes not at all, depending upon the cloud cover and temperature. Tip: I leave my vest and gloves in my pack for the entire hiking year! They are lightweight, take up a small amount of room, and are a lifesaver when I feel chilled. As mentioned above, you can start off the hike with a cozy headband covering your ears and back of your head. You'll be surprised by what a big difference it makes in your comfort level. If you tend to feel really chilled, skip the headband and wear a fleece hat. A brimmed hat (ball cap style) exposes your ears and neck for venting later in day, and works great to keep glaring sunlight out of your eyes. Read about hiking hats to see all of your options. gaiters (if conditions are wet or I know I'll be wading through dew-laden brush). Some female hikers start off wearing a jacket, then strip down to a short sleeve shirt and skip a vest. Note: you can get by with cotton if you know for a fact that day will be dry, but skip cotton year round in moist conditions. I've also seen hikers wear nylon shorts over long underwear bottoms or tights - an interesting fashion statement which has never appealed to me because I like my knees to be unencumbered on the trail as much as possible. I'm sure you have shorts & T-shirts or tank tops in your closet which would perform admirably on dry, warm days. I try to remember to stash a dry shirt in my pack for my turn around spot, and another one in the car. And the hat comes off at regular intervals to allow my sweat to evaporate. Your summer hiking attire can be simple, fast drying and easy to find in your closet when you first start doing straightforward day hikes. But after a few sweaty hot hikes where you're wringing out your T shirts at the lunch stop, I think you will gravitate toward more sweat-soaking, wicking fabrics. These promise more comfort, less odor trapping, and a more presentable appearance back at the trail head. In some parts of the world, we call it snowshoeing! Let's get a feel for the most extreme conditions you may face in a year of hiking. You can always dial these back a bit. Giving dayhiking tips for cold weather is tricky because ambient temperature is low, but you're going to work up quite a sweat as you move along. Use the same layering technique as in fall, but skip the sleeveless top layer. Instead, add a high collared sleeveless fleece vest over a long sleeved collared shirt, and remove your jacket at the trail head. This might cause shivering for the first five minutes of the snowshoe hike, but you will warm up quickly and won't have to stop to peel off a jacket. Every time you stop, you begin to feel chilled. A fleece hat and a pair of gloves helps, too. Take them off and add them back, as body temperature fluctuates. Snowshoeing pants should be breathable and waterproof. Add a set of long silk underwear underneath if you expect the day to be windy or wet. I've learned some behavioral modifications the hard way, and am eager to share them with you so you don't have to get cold and wet. At my lunch spot, I throw down a small tarp, plunk my pack down on it, and then sit on my pack to prevent heat transfer from my body to Mother Earth. I also throw on a windproof layer right away to preserve my body heat, and may also switch out my hat and gloves to warmer versions if the wind is blowing. On unusually cold days, I include long underwear, knowing that my waterproof pants have side zips to allow me to vent my body heat when needed (snowshoeing uphill, for example). My head wear at the trail head changes, too: I use a wool cap, sometimes with ear flaps, sometimes not. If I get too warm or the day turns sunny, I switch to a ball cap or a fleece head band. My neck seems to be the spot where cold air really bothers me, so I carry a fleece neck warmer like this one. Rely upon gaiters to keep the snow out of boots and also to provide an additional layer of insulation if you sit (or fall) in the snow. My winter boots are drastically different at this time of year - heavy and waterproof, with thick warm liners that can be dried separately. If I decide to hike on a wet but snow free low land trail, I skip all the heavy layers and just wear a long sleeved top under a waterproof jacket. My winter jackets have underarm vents for ventilation, but even so I'll be soaked through with perspiration by the end of the hike. Waterproof pants, no long underwear, and a rain hat (I use a "Snoqualmie Sombrero") complete my elegant ensemble. Read about waterproof hiking clothing here. Begin scouring magazines, websites, and books for dayhiking tips that apply to your area. Trail safety and comfort are essential to your enjoyment of this sport. Thinking of day hiking alone? 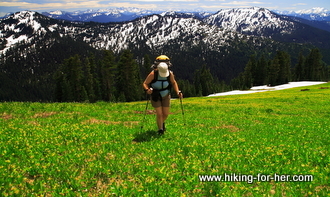 Read this for some great day hiking tips when you want to hike solo. Rainy day hiking tips can help you brave less than stellar weather. Want all of the best dayhiking tips all in one place? The Hiking For Her Best Tips For Dayhikers book is what you need to hit the trail, available in both paperback and e-book formats. Quality, performance, and durability are definitely tied to a higher price point. Certain companies seem to have a knack for delivering on the goods. And then fully backing up the goods with excellent customer services and policies. Here's my list of go-to companies along with why each of them belongs on my list. I never pay full price unless I'm up against a time crunch or I absolutely want that particular item. There are so many good deals to be had! You can sign up to receive emails alerting you to sales, price cuts, new merchandise, overstocks - some companies will literally TELL you when to save money. Here's my favorite place to score a deal: Backcountry. Also, there are sports equipment co-ops you can join. and you are eligible for yearly dividends based on earnings. You're also eligible for member-only deals, which can be quite tempting. I joined Seattle-based REI in 1978, and have enjoyed spending my member dividend every year since to upgrade my hiking gear. REI co-op benefits include a rebate every year, based on your purchases. Usually, the rebate is ~10%, which gives you a nice amount of money to spend on yourself - just for buying hiking gear!! For a closer look at the value REI delivers for women's hiking gear, read this. There's also a Canadian gear co-op that I joined a few years ago when I couldn't find the boot brand I'm partial to (Zamberlan) in any American stores. 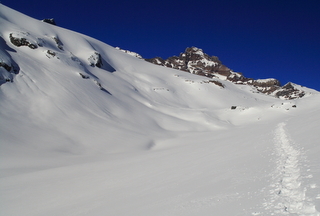 As proof, here's a photo of a snowshoe day hike near Mt. Rainier. Notice the snowshoe tracks, made by my husband and me in the pristine snow as we were heading to our predetermined lunch spot. See what I mean? A bit of muscle power can get you into some seriously gorgeous spots in just a few hours. 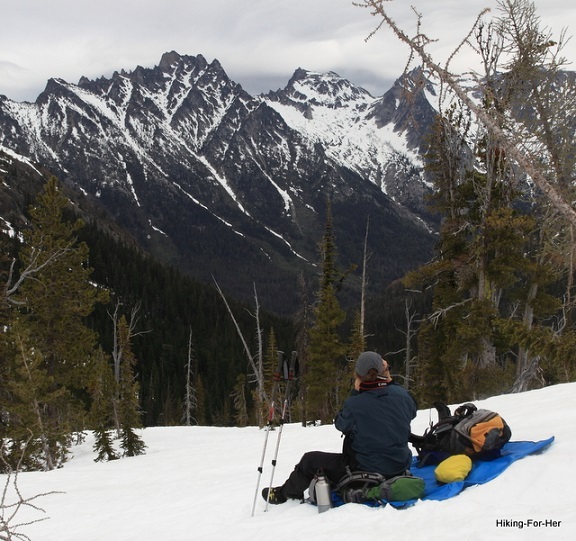 These tips are just to get you started thinking about what you'll need as a day hiker. There's plenty more ground to cover, so to speak! If you're still not sure where to start in your acquisition of a functional hiking wardrobe, or are interested in my "personal picks" for hiking clothing, drop me an email. Maybe a day hike just isn't enough! Hiking fever isn't life threatening! In fact, I'd call it life enhancing.